Dodge Charger Review: Forget the 1950s. Decades from now, people will look back on today as the golden age of American motoring. Think about it. We've just lived through a years-long horsepower war that's put excitement into the hands of more drivers than ever before. It's not uncommon to find cars that make 300 horses right on the dealer lot, many of which, like the Dodge Charger, are actually affordable. We can buy a super-Corvette that makes 620 horsepower, and is faster than some Ferraris, luxury SUV’s that feel like a mobile living room, or an American family sedan that's just as reliable as a Japanese car. Heck, even the legendary Camaro has come back from the dead. And even more than the 1960s, today is the true muscle-car era, a time when cars have not only raw power and style, but also have handling, steering and braking that all combine to make some very thrilling driving machines. A perfect example is the Dodge Charger. This modern-day muscle car has a look and feel that's authentically American, from its police-cruiser styling to its available V8 power that can smoke the back tires at will. It's big, brutish and exciting, but it's also practical for a family because of its roomy cabin and four-door layout. Unfortunately, if you like this kind of muscle car, you'd better buy one quickly, as they won't be around for much longer. Thanks to new federal fuel economy standards that will require cars to average 39 miles per gallon in just a few years, cars like the Dodge Charger are going to either disappear or become so expensive that very few people can afford them. Even in its most fuel-efficient version with the smallest V6 engine, the Charger gets just 26 mpg on the highway. That's not bad considering what a big car it is, but it's definitely not good enough to meet the upcoming standards. More impressive is the mileage the Charger gets from its biggest engine, a 5.7-liter Hemi V8 that makes an almost unbelievable 368 horsepower and still gets 24 mpg on the highway. That's an engineering feat Dodge ought to be proud of, because very few engines make so much power while burning so little fuel. That counts as a fuel-efficient car in my book. Another surprising trait is how well it handles in corners. Unlike the American muscle cars of old, which were said to only go fast in a straight line, the Charger feels perfectly comfortable winding down narrow country roads or slicing through corners. It's no sports sedan, but it's more nimble than you'd expect from such a heavy car. My favorite feature on the Charger, one that's wonderfully easy to use, is called "uconnect tunes." This $650 option includes a 30-gigabyte hard drive to store all your favorite music, turning your car into a rolling MP3 player. I plugged my USB drive into the dash, and within a few minutes it had copied my entire music collection onto the hard drive, which is controlled by an LCD touch screen. Pricing starts at $25,585 for the basic Charger SE, which comes with a 2.7-liter V6 engine that makes 178 horsepower. For $27,200 you can get the Charger SXT with a bigger 3.5-liter V6 that makes 250 horses. And if you want the Hemi-powered Charger R/T, pricing starts at $32,910. Let's enjoy this golden age while it lasts. It won't be long before we're looking back on these good old days because, ironically enough, Uncle Sam will have legislated classic American Muscle Cars like this out of existence by the year 2016. What was tested? 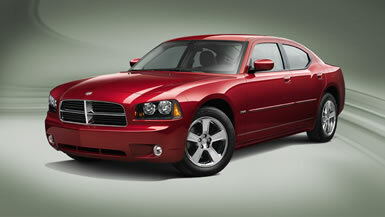 The 2009 Dodge Charger SXT with a base price of 28,855. Options on the test car: Uconnect tunes at $650 and a power sunroof for $950. Total MSRP price as tested including the $750 destination charge is $31,205. Why avoid it? It doesn't get great gas mileage, and the interior isn't as refined as you'll find in some competitors. Why buy it? It has classic American styling and is available with lots of power, including a surprisingly efficient Hemi V8 that makes 368 horsepower. Bottom Line: The Dodge Charger has classic American muscle-car styling, with an aggressive front grille and squared-off fender flares. It’s spacious inside, with wide bucket seats up front and plenty of leg room in the back. Despite its muscular looks, it's actually a very practical car for families.